Washington Blue Lion senior Kory Proby takes the ball to the basket during an SCOL game against East Clinton at Washington High School Tuesday, Jan. 24, 2017. 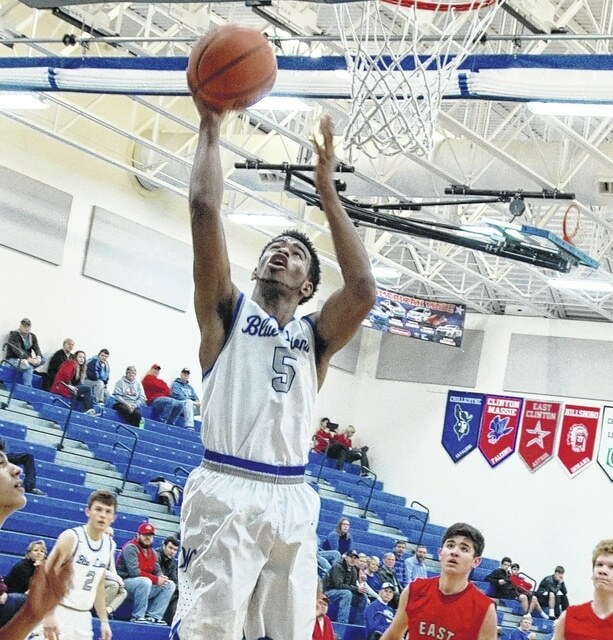 The Washington Blue Lions parlayed a big first quarter into a 51-42 South Central Ohio League win Tuesday night over East Clinton at the WHS gym. East Clinton drops to 1-8 in the league and now stands 2-11 in all games. The win puts the Blue Lions at 7-7 overall and 5-3 in the SCOL. “That first quarter doomed us,” EC head coach Tony Berlin said after the game. On the other side of the gym, Washington head coach Shannon Bartruff said the win was good but losing a near 20-point lead was not. “I thought for 25 of the 32 minutes, we played pretty solid,” said Bartruff. “Then we got out a little out of whack. Early in the game, though, the Blue Lions had few issues. Kory Proby scored the first six points of the game for Washington and the Blue Lions were off and running, literally. The fast-break offense was effective, the defense was lock-down tight and the half-court offense was efficient. Proby gave WSHS a 6-4 lead. Kenny Upthegrove and Dillon Steward both had 5 points in the opening period. Jarett Patton had a steal and layin to make it 10-4. In all, Washington put together a 9-0 run to seize control of the game, 15-6. A 10-0 scoring spree in the second made it 25-6 Blue Lions. JT McCarren drained a 3-pointer to stem the tide a bit, 27-10 but still the Astros were behind 29-12 at the half. “We kind of went stagnant in the second quarter but I felt we were still guarding well,” said Bartruff. In the third, the lead grew to 19 as Patton had another steal and basket. Evan Upthegrove dropped in a 3-pointer and the Blue Lions seemingly had this one in the bag, 36-14. The Astros began their charge late in the third period. McCarren’s old-fashioned 3-point play started an 11-2 EC run. Cameron Conner followed with a 2-pointer then a 3-pointer at the minute mark and the Astros trailed by 16 going to the final frame. Berlin had seen it before. He knew his squad had it in them to make a game of it, if they were patient. “We told them they weren’t going to get all 22 points back at once,” said Berlin. “We were going to have to put together 4 or 5 possessions (and chip away). Brendon Jenkins started the fourth with a 3-pointer, 38-25. It was still a 13-point game when Matt Mitchell had a steal at one end and turned that into a 3-pointer at the other, 42-32. Alex Pence force a Blue Lions turnover that led to another McCarren basket and the Astros were within eight, 42-34. Mitchell to Jenkins was good for another 3-pointer as East Clinton pulled to within 44-37. Mitchell’s basket at the 2:30 mark off an inbound pass from Wyatt Floyd made it a 44-39 Blue Lions lead. Dillon Steward may have saved Washington with a 3-pointer with 64 seconds to play, 47-39, and an old-fashioned 3-point play with 41 second to play, 50-42. Sandwiched in between those Blue Lions points was a 3-pointer by Floyd. Washington is back in action Friday in Greenfield to take on the McClain Tigers. McClain lost to Chillicothe Tuesday, 65-44. Elsewhere around the SCOL, Clinton-Massie edged Hillsboro, 69-64 and Wilmington got by Miami Trace, 44-40.